A dose of skepticism is a good thing. Caution in belief helps us better understand the truth of the world around us, and saves us from being the victim of people who would benefit from our deception. We’re told to believe “half of what you see and none of what your hear.” Our experience encourages skepticism. When we look at history, time and time again, we see that science has been wrong (in some cases really wrong) about popularly held beliefs. Contrary to prior assumptions, Earth is not the center of the solar system and “bad air” did not cause the Black Death. We have learned to be careful of what we accept at face value. This past evidence seems to suggest that whatever those whacky scientists are selling us today is sure to be spoiled goods by tomorrow. We may as well begin from a position of disbelief. (Ignore for a moment, will you, that the reversal of those wildly wrong hypotheses was brought about by, you guessed it, scientists selling the newer, better version of the truth.) So, when former Vice President Al Gore (a man once overly enthusiastic about his role in the development of the Internet) made a movie distilling decades of research into a 100 minute slide show, we may have been tempted to adopt a Missourian attitude. What, after all, does a politician know about climate science? Our skepticism is natural and positive, but should never be confused with intransigent denial. The skeptic is never the zealot. Indeed, the skeptic is as welcoming to being right as he or she is to being wrong — the truth (or as close as we can come) is what matters. A recent and much reported example of skepticism related to climate change is the study done by Richard Muller, a physicist and skeptic working at the University of California at Berkley. He was so concerned that perhaps climate scientists had come to false conclusions that he an his team spent two years checking the work. 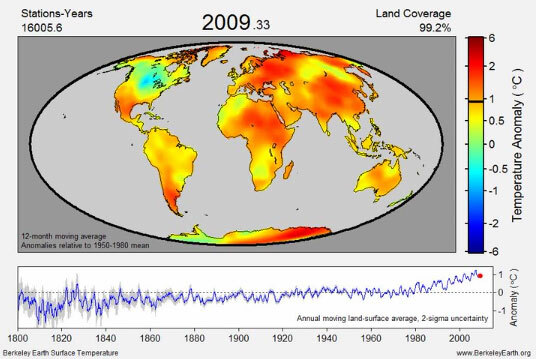 Muller was concerned about the quality of the data that had been used by climate scientists. The influence of urban heat islands and improperly calibrated equipment could have skewed the results. The team developed the Berkley Earth Surface Temperature project to display and continue their research. The current conclusion is that global warming is real. The New York Times editorial cited above acknowledges that Dr. Muller is unsure of the degree to which human activity is responsible for the temperature increase he found. And that is the beauty of a genuine skeptic. The question asked was whether the conclusion that the climate was warming was correct; it was. Drawing further conclusions, without adequate evidence (climate has a lot of variables, and Dr. Muller was looking at one measurement: surface temperature), would be out of character for a skeptic of Dr. Muller’s status and expertise. What we find when we look into the scientific literature is that everyone agrees the climate is changing. Most climate scientists, whose methods and equipment have evolved somewhat since the Galileo Affair, agree that climate change is anthropogenic (human caused) in nature, despite the appearance in the political realm and media of widespread dispute. Granting that every question can never be fully answered to the satisfaction of everyone, when it comes to climate change, the consensus of science is that the change is real and the time-frame in which to act may be closing. While there is a real cost to action, the price of inaction may be too great for our species to bear. As we move forward, gather more information, and get a clearer sense of the way through this change, it is important that we maintain a healthy skepticism. A skepticism that helps us find our way to the truth, and not a skepticism that insulates the status quo. We can chase our tail to exhaustion if the so-called skeptics, are truly zealots in skeptical garb. We need to be smart, brave and, above all, skeptical when the way to real solutions is blocked by senseless resistance.